My Husband's Not Jewish So I Can't Be a Rabbi? That's Crazy! I am a corporate lawyer who, after eight years, is ready for a career change. I’ve long dreamt of becoming a rabbi and now that I am entering my mid-30s I feel like the time is right to give it a shot. My problem? My husband isn’t Jewish, which makes me ineligible for Reform, Conservative and, as of now, Reconstructionist rabbinical school. We had a Jewish wedding, he participates in our Jewish home and we had a bris for our son who will be starting a Jewish preschool this fall. Does he want to convert? No. But he comes along to our Reform synagogue with me whenever I ask and what he lacks in faith he makes up with a deep curiosity about our cultural and intellectual heritage. Am I so wrong to think that I should be able to pursue my dream of becoming a rabbi? You are not wrong. We should embrace potential leaders, like you, who dream about dedicating their lives and careers to growing and transforming Judaism. The irony is that rabbis from religiously diverse families may actually better serve the next generation of Jews. My partner and I faced this challenge as well. Although I loved my experience at rabbinical school, I struggled with the “non-Jewish partner” policy. Like your husband, my partner did not grow up Jewish. I never asked her to convert and never wanted her to do so for me. 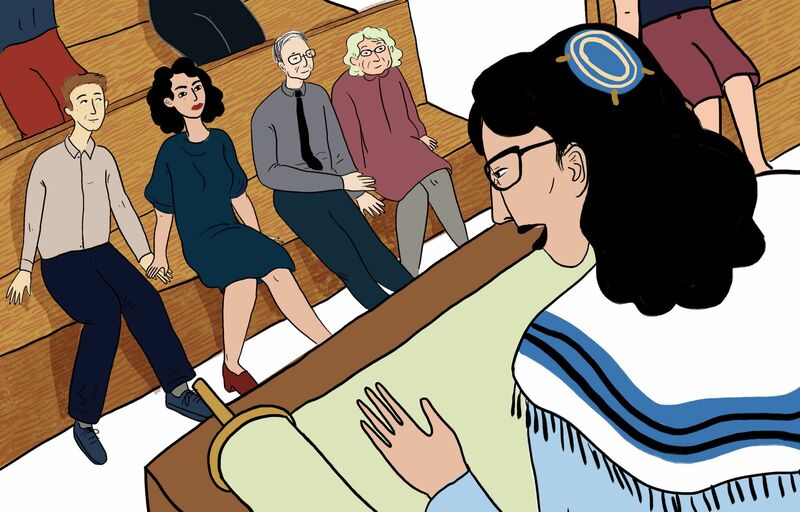 In my case, she did choose to convert, but the experience of having a partner who is not Jewish during rabbinical school profoundly affected my rabbinate. My belief that this policy is fundamentally flawed has, in part, propelled me to focus on intermarriage issues in my rabbinic work. Safeguarding the rabbinate for those who marry other Jews may have made sense in generations past. Does it still make sense as the rate of intermarriage among non-Orthodox Jews reaches 70%? Today’s interfaith families are seeking a Judaism that is relevant and accessible to each family member. As for the Jewish establishment’s fear that such models will discourage Jews from choosing Jewish partners? Frankly, neither rabbinical schools’ partner policies nor relentless messages of endogamy have managed to stave off this phenomenon so far. It’s also worth keeping in mind that the role of the rabbi’s spouse is different than it once was. Most liberal rabbis’ spouses have full careers of their own, and while they might help model creating a Jewish home, it is no longer considered their job to do so. Some Jewish spouses may not even be as curious and receptive as your husband, and no rabbinical school I know of asks the Jewish partner of a potential rabbi for a statement of commitment to Jewish life. Becoming a rabbi is a weighty decision. If you do choose this path, I hope that the Reconstructionist Rabbinical College, my alma mater, will have changed its policy by the time you apply. Those of us with religiously diverse families are uniquely situated to bring wisdom, knowledge and compassion to interfaith families exploring Jewish life. Drawing on our personal stories and experience, we are poised to model for others how good communication, flexibility,and introspection can help strengthen the next generation of seekers. Rabbi Mychal Copeland is the Director of InterfaithFamily/Bay Area and blogs here. Her forthcoming book, “Struggling in Good Faith: LGBTQI Inclusion from 13 American Religious Perspectives” [SkyLight Paths Publishing], will be available this fall.